So apparently there's been outrage over this airing of an advert for abortions. Now, for those of you who don't know; this is the first time they have legally been allowed to advertise abortion on television. Prior to this, they've been running retarded contraception adverts which anyone with a brain can tell you is pointless, because teenagers smart enough to use contraception are already doing so (which, granted, is almost certainly a minority). So, the Government has brought in a new scheme, showing pro-abortion adverts, and this has disgusted pro-life and christian groups (don't you just love the term "pro-life"? it's like anyone who isn't anti-abortion is actively against life - like if you support abortions, you're a serial killer! But I don't want to brag too much about my personal life here...), who see it as being wrong, and such (I don't have a quote from a Church group regarding abortions, but I am informed that God hates the Fag enablers, which is probably relevant somehow???). 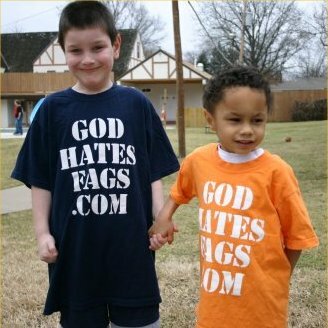 Ironically, there's a picture of the white kid's dad from 30 years ago wearing a shirt saying "God Hates Niggers"... what's the bet in 30 years time this kid's son will be standing with a really camp looking gay kid wearing a shirt saying "God Hates Prawns", or something? Oh, also - THEY HAVE THEIR OWN WEBSITE? p.s. yes, I will write something serious again soon - I'm just a tad busy at the moment. I'll probably try and catch a film in the week or something, let you know what I think. Latas, Geezas.